JARO, Iloilo City, Feb. 4, 2017 – As thousands of pilgrims flocked to this district to honor Our Lady of Candles on Feb. 2, the Feast of the Presentation of the Lord, a high-ranking archdiocesan official invited the faithful to appreciate even more Mary’s role in the formation of Filipinos as a Christian people. “As Filipinos, we get to understand ‘Christ-centeredness’ through the lens of our family experience of motherhood that, through almost 500 years of our history of faith, it spreads and grows into our people’s deep love for Mary as our Mother,” Msgr. 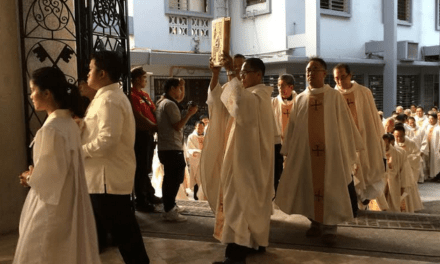 Jose Marie Delgado told the faithful gathered at the Jaro Cathedral during the pontifical fiesta Mass presided over by Jaro Archbishop Angel N. Lagdameo and concelebrated by numerous diocesan and religious priests. 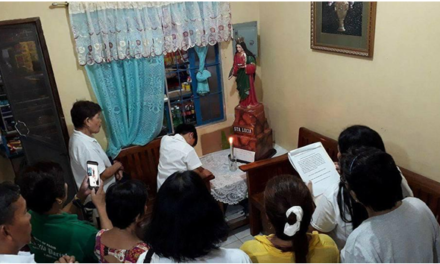 As the designated homilist for the fiesta Mass, the priesst cited the strong filial relationship local Catholics have with the Blessed Virgin. “As Filipinos, especially Ilonggos, we are Christianized with a deeply ‘Marian maternal touch’. “The term ‘Iloy’, vernacular for ‘mother’, is central in the Ilonggo devotion to Mary. She is referred to as ‘Iloy nga Mahigugmaon’ (Loving Mother), ‘Iloy nga Mananabang’ (Mother of Perpetual Help), ‘Iloy nga Makagagahum’ (Mother Most Powerful),” he explained. According to the priest, this intimacy with the Blessed Mother has a purpose – to draw her children to Jesus. “But for us to benefit spiritually from our closeness with her, let us not just see this closeness from our side. This is a two-way traffic. It cannot be any other way. We are close to her; she is close to God,” Delgado pointed out. 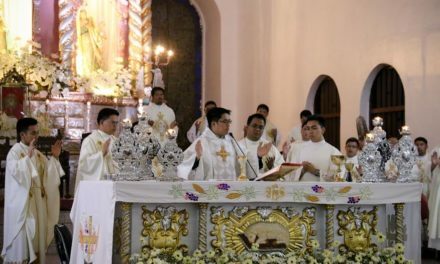 The homilist also pointed to several significant details of the image of Nuestra Señora de la Candelaria, venerated by thousands of devotees even from abroad. “For Mama Mary, this closeness of her with her Son means that she is His Mother and His disciple as well,” explained Delgado.